Units on Ocean hexes occupy boats and are considered naval units. While in reality each boat may accommodate multiple troop units, for game play purposes it is considered that each naval unit in a hex occupies its own individual boat. Normal unit movement rates do not apply to units on ocean hexes. Any scenario with naval forces will have an abstracted direction of nett wind and tidal forces. This will be along one or more of the 6 axes of the board’s hexes and will be noted on the scenario map. A moving naval unit will always be moving across one of the 3 hex sides with, or one of the 3 hex sides against, the wind/tide. 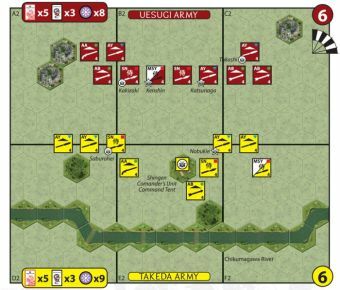 An ordered naval unit may always move 1 hex in any direction (Exception – see Grappling). An ordered naval unit may move 2 hexes if its entire movement is with the wind/tide. Exception: Any card effect which increases movement will override limitations imposed by wind/tide. An eligible unit may take ground (water) in any direction regardless of the wind/tide. 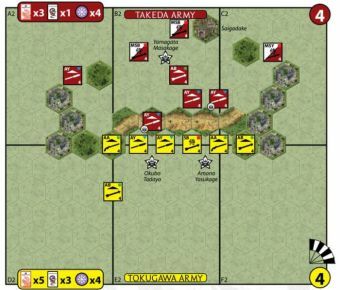 In scenarios including both ocean and land terrain, ordered units may embark (move from a land to ocean hex) or disembark (move from an ocean to land hex). The unit must start its turn adjacent to the land/ocean hex it is moving to, may only move the 1 hex, which may not be increased by card effects, and may not battle on the turn it embarks/disembarks. An embarking or disembarking armoured unit is vulnerable to attack. Lay the figures of an embarking or disembarking unit flat (alternatively, mark them in some other way, such as with a coin or token). Figures are stood upright at the beginning of the player’s next turn. While a unit is lying flat, it receives neither rank or cavalry resistance to swords rolled in close combat. A disembarked unit functions in all other ways as a normal unit of its type. An embarked unit is subject to all naval rules. Units may not take ground from ocean to land hexes, or from land to ocean hexes. A unit which rolls one or more swords against an enemy naval unit in close combat may elect to allocate one of those sword die rolls as a grapple in lieu of causing a hit. The grappler may be another naval unit or a land unit on an adjacent shore hex. If the target unit would have status resistance to sword results from the attacker, a sword result may still be committed to a grapple, with any additional sword results counting as the first, second, etc., for purposes of causing hits on the target unit. If a unit would not normally hit on swords in close combat (Irregular Peasant Infantry) it may still apply a sword result to a grapple. Place a marker between the hexes of grappled units. Both units, the grappler and the target, are now grappled. 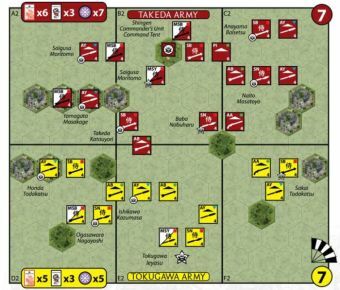 While grappled, units may not move but ordered units in the grappled hexes may still battle. A grappled unit conducting close combat against its mutually grappled enemy may allocate one sword result to severing the grapple between them (with all the same rules that apply to the original grapple roll). Remove the grapple marker from between the hexes. 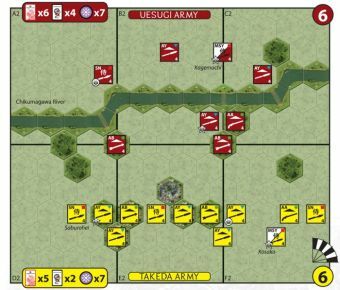 Ungrappled units are immediately free to move. All naval units roll 1 less die in close combat and ranged attacks. Attack dice may be increased by Leader Inspiration and Command or Dragon card effects. A land-based unit on a shore hex rolls 1 less die in close combat against a naval unit in an adjacent ocean hex. 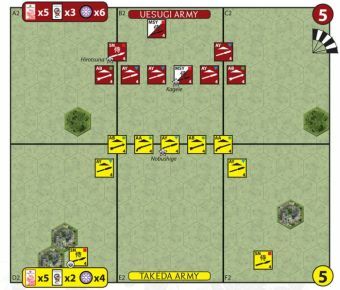 Ranged attacks by land units against naval units are unaffected. 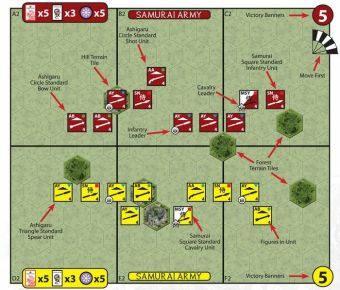 Naval units never receive a reduction in close combat or ranged attack dice due to naval movement (this applies to all ranged attack units, and close combat for Samurai Archers, Mounted Samurai Archers and Sohei Archers). 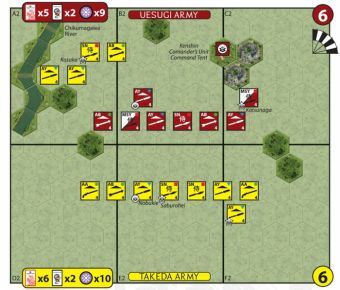 Naval units may always battle after moving their full naval movement allowance, even if they would normally be prohibited from doing so on land (this applies to 2 hex naval movement for Ashigaru Spearmen, Sohei Warriors and Sohei Archers). Mounted naval units are dismounted. They retain their usual stats but do not receive cavalry resistance to sword results in close combat and do not receive bonus close combat after gaining ground without a leader attached. The appropriate cavalry figures are still used as they will function as the normal mounted unit if they disembark. Naval units never retreat in response to flags rolled against them. Any flags which cannot be ignored are treated as hits (the samurai throw themselves into the sea to drown). Land units may not retreat onto adjacent ocean hexes. At sea, naval leaders are all treated as infantry leaders, including the limitation of providing Leader Inspiration only to the unit to which they are attached. A cavalry leader still uses the appropriate cavalry leader figure as it will function as a normal cavalry leader if it disembarks. Open ocean hexes are impassable to lone naval leaders. Detached naval leaders may move 1 or 2 hexes when ordered, regardless of the direction of wind/tide or grappling status, as long as both hexes of movement contain friendly units (as the leader transfers from deck to deck of boats in his own fleet). A retreating naval leader may retreat 1 to 2 hexes only so long as each of the retreat hexes contains a friendly unit (the leader retreats from deck to deck of boats in his own fleet). If there are only open ocean hexes or enemy units in retreat hexes, the leader must commit seppuku (this also applies to a leader on a shoreline land hex with only open ocean hexes behind it). A naval Commander and bodyguard unit may be listed in the scenario notes, occupying a Command Ship. The Command Ship is designated by a Command Tent tile. A Command Ship follows all the usual rules for a Command Tent except that it may move as per the naval unit movement rules. A Commander and bodyguard unit may disembark normally, at which point the Command Tent tile is moved to the shore hex and thereafter becomes a normal Command Tent (meaning it can no longer move on land). Likewise, a Commander and bodyguard unit may embark from a shore hex adjacent to an ocean hex, at which point the Command Tent tile becomes a Command Ship and is subject to naval rules. 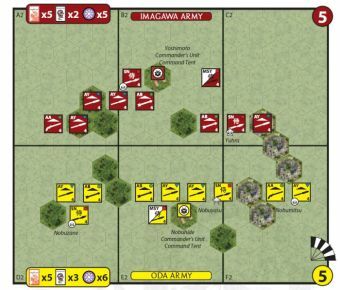 • Infantry Onslaught – If an army has a mix of land and naval units in play, this card may be used to order either land units (in which case it functions as per its normal text) or naval units, not both. When used to order naval units, 4 adjacent naval units may move 2 hexes, even when moving against the wind/tide, and conduct close combat. 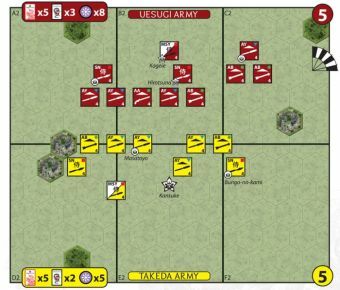 • Cavalry Charge – If a commander has a mix of land and naval units in play, this card may be used to order either land units (in which case it functions as per its normal text) or naval units, not both. If ordering 4 naval units, there is no effect on movement allowance but the units receive the +1 die in close combat. • Serpent Command - ordered units are limited to 1 hex movement, as per the card text, regardless of the wind/tide. Note that the naval rules mean that some Dragon cards will have enhanced power in naval battles (Red Dragon, Panic, Cowards, Strike Fear and Blue Dragon), simulating the perils of seaborne warfare.